It was the morning after the night before and the boys awoke in Ulaanbaatar, the capital of Mongolia and also the spiritual home of the rally. The boys were going to get a bit spiritual later on when they learnt more about the Buddhist culture, but first things first. 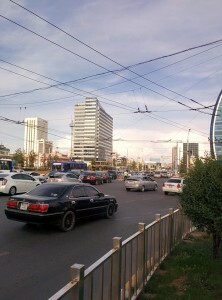 Ulaanbaatar is a very busy city! Unfortunately, the previous night had turned a bit nasty. Some of the convoy had been at a Karaoke club in the city and they had been charged an outrageous amount for drinks that they hadn’t ordered! Refusing to pay a couple of them had got in a scuffle with a couple of locals; most managed to get away unharmed but Mark from The Yorkshire Special Branch and Dave from The Haggis Hunters had not escaped. Mark was in a fight with one of the locals and Dave was filming it on his phone for evidence to show the police. Unfortunately the local soon realised this and went for Dave; eventually both got away ok but Dave’s phone had been stolen in the mele. Because of this “Rolling Thunder” stayed in the hostel for the early morning in order to help Dave with contacting the police. The hostel host was also very helpful and even got Dave in contact with the club owner who, of course, denied that the bill had ever existed. In the end everyone realised that the Mongolian authorities were very unlikely to get anything sorted in the 2 days that they were staying in the city and decided to cut their losses and do some sightseeing. 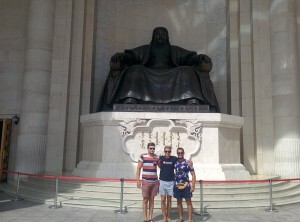 The boys in front of the Chinggis Khan Monument. In typical Mongol Rally style this was a sweltering day and the air was quite thick due to all of the road traffic about. The group first made their way to the Genghis (or Chenggis, whichever you prefer) Khan Square, here there is a massive statue of him sitting overlooking the square. Khan formed the Mongolian empire, the largest empire the world has ever seen (at its height it stretched from East Asia all the way to modern day Hungary, and the boys knew how far away that was!). Whilst there a few of the convoy bought paintings on leather canvas from local artists, Dave got a rock bottom price to make up for the loss of his phone! 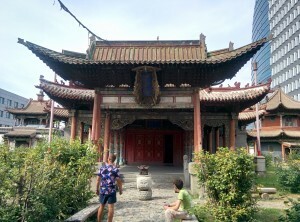 One of the buildings in the Buddhist monastery. In the afternoon, Henry went hunting for gifts in the local market and Matt and Duncan went with Chris from Aston Micra to the Choijin Lama Museum, a Buddhist monastery. The market was very busy and had lots on offer; hats, carpets, food etc. At the monastry the boys saw same antique paper mache models of spiritual figures and got to witness a real Mongolian throat singer which was quite amazing. 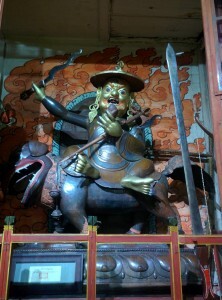 One of the many figures in the monastery. After a lot of walking around Dunc, Matt and Chris decided they needed some food and so found their way to a local branch of KFC they had spotted earlier (it’s surprising how these big companies are already springing up in Mongolia’s capital, apparently only 10 years ago wild animals roamed the streets!). The best bit about the KFC, though, was the air conditioning, it was so refreshing after the heat of the city. This didn’t however make up for the fact that the ice cream machine was broken which meant the boys had to endure a 30 minute wait, this however only meant they could spend more time in the coolest building in town. The boys returned to the hostel, which was very nice it must be said, to meet up with the others. That evening the three CCBB boys went out to a steakhouse type restaurant, one of the options on the menu was boiled sheep’s brain but novone chose that! After a nice meal and a few drinks all three boys went to bed early keen to get some good sleep for what was going to be, hopefully, an overnight drive to the finish line in Russia the following day. It had been a remarkable day in an amazing city and the boys want to look around a bit more the next morning.